A food vendor in Bang Chak Market cleans one of her tables after she closed her shop for the last time Monday. The market closed for good Monday. I've been photographing the Bang Chak Market for the last few months. I found the market by accident, which is sort of my usual way of finding stories in Bangkok. I walked past it on my way to another story in the neighborhood. The market had a nice community vibe to it so I started going back. I soon discovered that the market was set to close and be demolished to make for a new condo development. 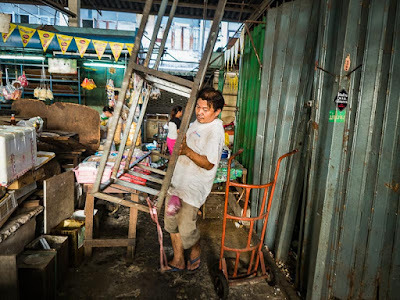 Vendors move their property out of the market after it closed Monday. The market was supposed to close Dec 31 and a few shops around the market did close in the week leading up to New Year's but most stayed open through the long weekend. By Monday, January 4, though there was no denying the end and the market closed for good at the end of the day. 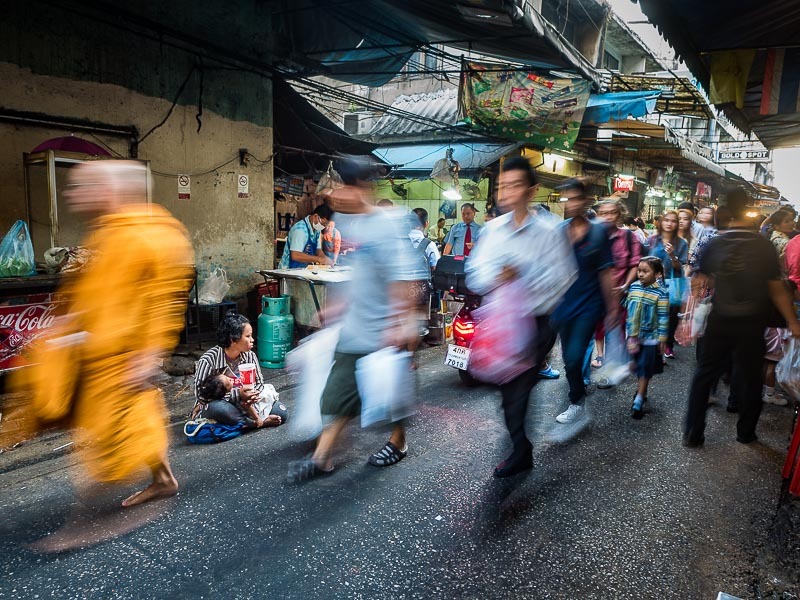 A monk and commuters walk past a beggar near the entrance to the market. 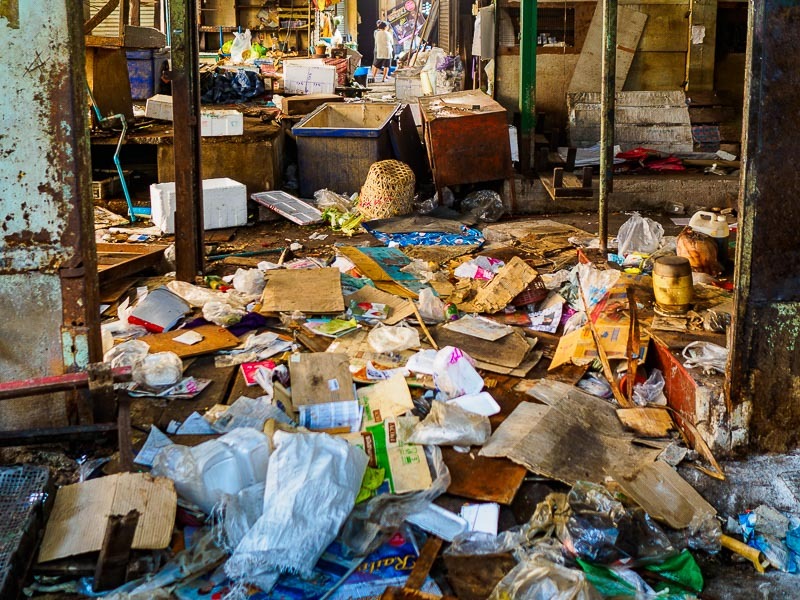 I went to the market a couple of times last week. It was hard to believe the market was closing. Most of the vendors were still accepting new inventory and people were shopping as though nothing was happening. When I went home after spending most of the day in the market on New Year's Eve I wasn't sure the market would really close. When I went back Monday morning (Jan 4) it was almost business as normal. A few of the shops around the periphery of the market had closed and my favorite coffee vendor in the market was gone but the butchers and fish mongers, produce sellers and food stalls were open and doing business. About 10AM though everything changed. 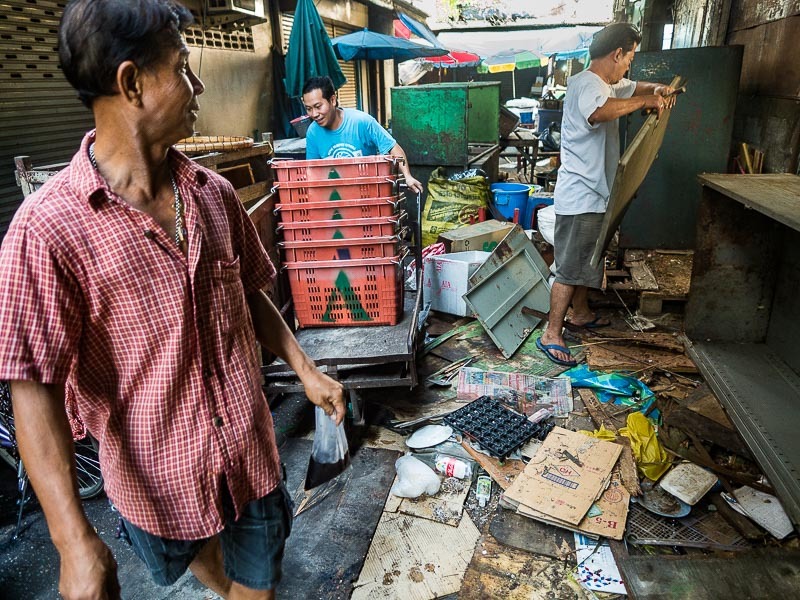 People were still selling but workers started taking apart market stalls and packing up. 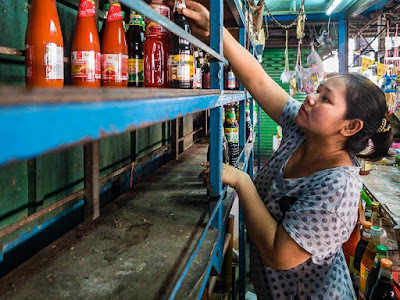 A shopowner in the market packs up bottles of hot sauce. 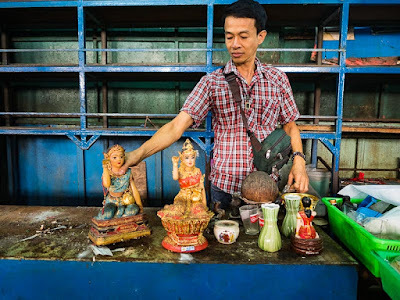 While another vendor takes down a Buddhist shrine in a market stall. A couple of hours later the market was basically gone. The structure was still there but the shops and stalls were closed and people were going home. The market has been there for about 40 years and I was expecting it to be an emotional moment but it wasn't. People packed up and left. A worker moves shelving out of the market. It's hard not to be disappointed about the market's closing. 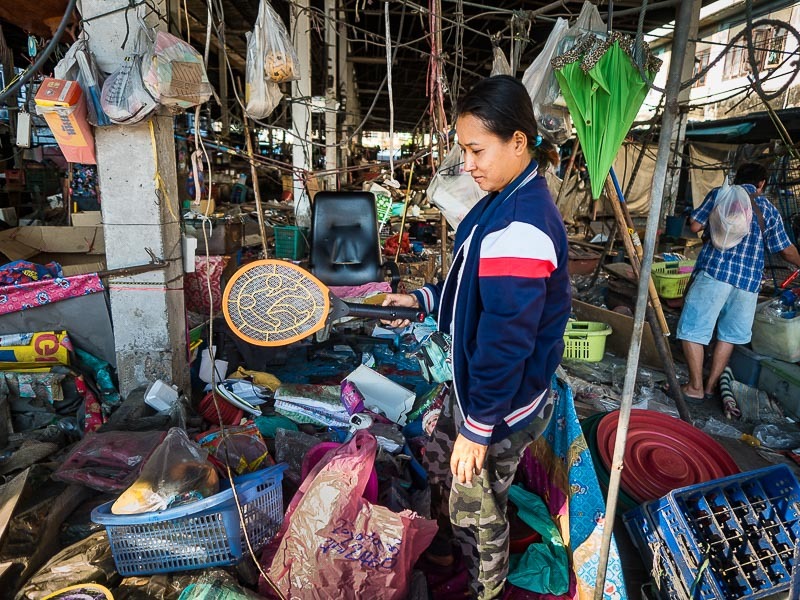 Small markets, like the Bang Chak Market (or the amulet market on the riverfront), are where most working class Thais go to shop and socialize. Closing a market, like the Bang Chak Market, is taking an important resource away from the community and weakening it. Most of the people who shop in the markets can't afford to shop in the grocery stores like Tesco or Big C. So they have to go further and further to find a market and transportation in Bangkok is expensive and time consuming. Most of the vendors in Bang Chak are moving to other markets but many aren't sure where yet. And they have to relocate their business, losing the customers they've spent years cultivating. Some might have to move a few kilometers but others might have to leave Bangkok and move out to another province. A produce vendor on the last day of the market. 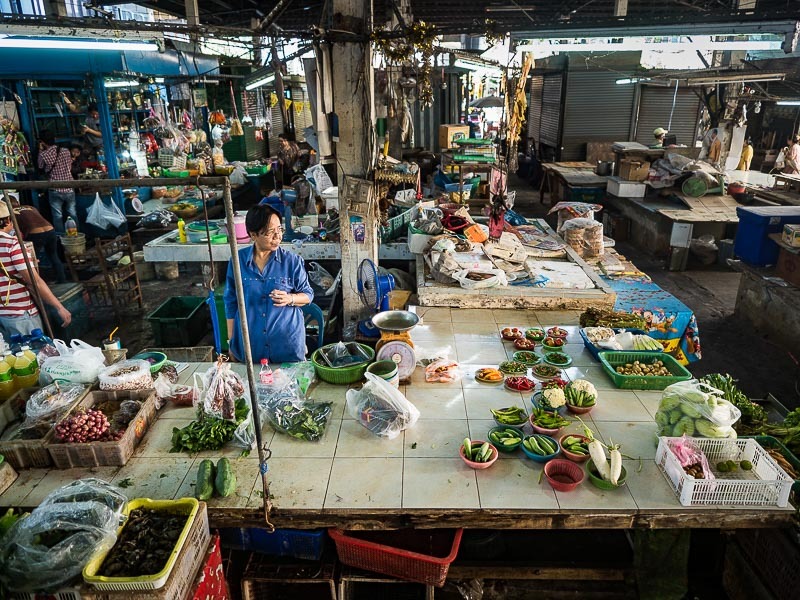 The photos I made in Bang Chak Market are part of what has become a project for me - documenting the end of neighborhood markets. 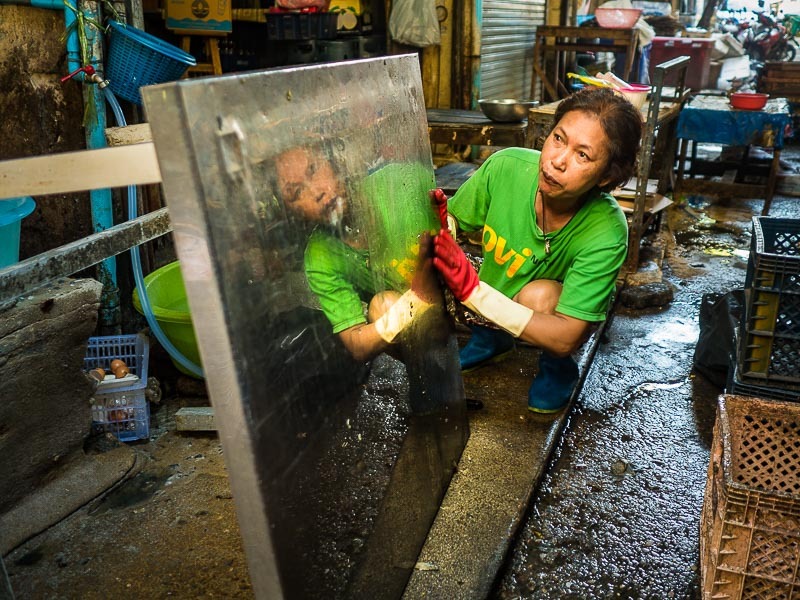 I don't know what I'm going to do with the photos, but I think it's important to record this aspect of Thai life before it's gone. A woman walks through the market Tuesday after it closed Monday. She was looking for things she can salvage or recycle. There are more photos of the market in my archive.